From the Pulitzer Prize-winning, bestselling author of The Emperor of All Maladies - a magnificent history of the gene and a response to the defining question of the future: What becomes of being human when we learn to "read" and "write" our own genetic information? Throughout the narrative, the story of Mukherjee's own family - with its tragic and bewildering history of mental illness - cuts like a bright, red line, reminding us of the many questions that hang over our ability to translate the science of genetics from the laboratory to the real world. In superb prose and with an instinct for the dramatic scene, he describes the centuries of research and experimentation - from Aristotle and Pythagoras to Mendel and Darwin, from Boveri and Thomas Morgan to Crick, Watson and Rosa Franklin, all the way through the revolutionary twenty-first century innovators who mapped the human genome. As The New Yorker said of The Emperor of All Maladies, "It's hard to think of many books for a general audience that have rendered any area of modern science and technology with such intelligence, accessibility, and compassion ... An extraordinary achievement." Riveting, revelatory, and magisterial history of a scientific idea coming to life, and an essential preparation for the moral complexity introduced by our ability to create or "write" the human genome, The Gene is a must-read for everyone concerned about the definition and future of humanity. This is the most crucial science of our time, intimately explained by a master. 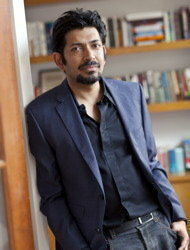 Siddhartha Mukherjee is a cancer physician and researcher. He is an assistant professor of medicine at Columbia University and a staff cancer physician at the CU/NYU Presbytarian Hospital. A former Rhodes scholar, he graduated from Stanford University, University of Oxford (where he received a PhD studying cancer-causing viruses) and from Harvard Medical School. His laboratory focuses on discovering new cancer drugs using innovative biological methods. Mukherjee trained in cancer medicine at the Dana Farber Cancer Institute of Harvard Medical School and was on the staff at the Massachusetts General Hospital. He has published articles and commentary in such journals as Nature, New England Journal of Medicine, Neuron and the Journal of Clinical Investigation and in publications such as the New York Times and the New Republic. His work was nominated for Best American Science Writing, 2000 (edited by James Gleick) . He lives in Boston and New York with his wife, Sarah Sze, an artist, and with his daughter, Leela.